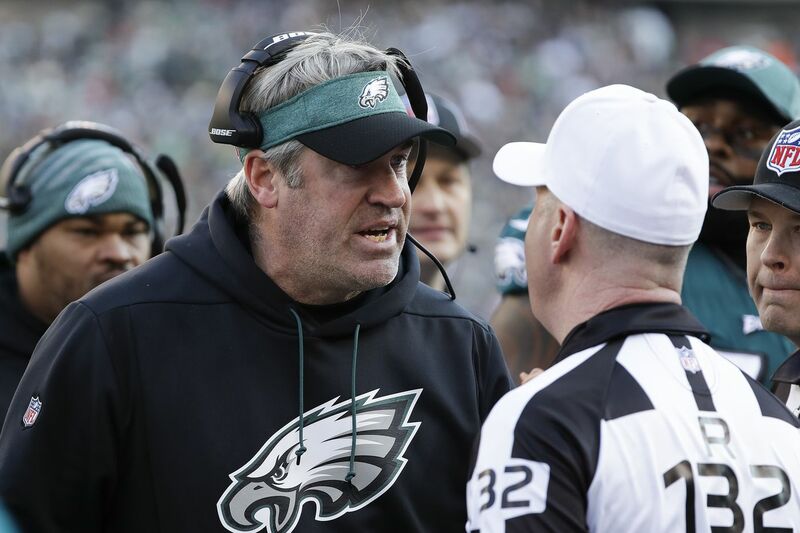 Doug Pederson argues with an official after a face-mask call on Jadeveon Clowney wasn't called in the second quarter. The Eagles beat the Texans, 32-30, to keep their playoff hopes alive entering the final week of the regular season. UP -- The legend grows. Foles added to his storybook second act by leading the Eagles to a comeback victory with their postseason hopes dangling. He was a little shaky in the first half, but the quarterback dropped deep dimes after the break and missed just one play after taking a brutal shot to the ribs on the winning drive. UP -- It was vintage Pederson, circa 2017, as the Eagles coach gambled on four fourth downs and converted each one. They weren’t reckless decisions, and Pederson dialed up great calls on each play. UP -- Ertz set the NFL record for receptions in a season by a tight end -- passing Jason Witten at 110 and finishing with 113 -- and caught two touchdown passes. But his biggest catch might have been a 20-yard snag on third-and-10 on the final drive. UP -- Jim Schwartz’s unit held Texans running backs to 11 carries for 13 yards and made Houston one dimensional. It worked for most of the game, until Deshaun Watson cracked the Eagles secondary. Nelson Agholor falls into the end zone after scoring a long touchdown in the third quarter. UP -- Foles’ 83-yard bomb to Agholor was a beautiful rainbow, and the Eagles receiver toasted the Texans’ Tyrann Mathieu on a deep post. UP -- The Eagles had been easing Sproles back into the mix after he missed 10 games with a hamstring injury, but they took off the kid gloves Sunday and utilized the running back in space. Sproles finished with 119 total yards and scored the first touchdown with a tackle-breaking, 37-yard catch-and-run. DOWN -- There were 21 total penalties called, which were too many when you consider the phantom roughing-the-passer flags tossed after J.J. Watt and Brandon Graham hit Foles and Watson. But the refs also missed a few, most notably when Jadeveon Clowney tackled Foles by the helmet. UP -- Halapoulivaati Vaitai, who once again had to jump in at left tackle after Jason Peters parted early, had some early rough moments against Clowney. But Lane Johnson kept Watt in check, and the rest of the unit helped keep Foles clean for most of the game. SIDEWAYS -- Douglas was humming along, covering and tackling well on his side, until the Texans’ late surge. The Eagles cornerback got beaten by receiver Vyncint Smith and was late to react on Houston’s go-ahead touchdown. DOWN -- The rookie running back was held to 21 yards on 11 carries and injected life into the Texans when he fumbled in the fourth quarter. UP -- He built a locker stall shrine to Nick Foles and backed up his juju with two sacks and a forced fumble. Every team needs a leader/character like Long. DOWN -- The Eagles got no help from Detroit, which went belly-up in the second half and lost to the Vikings. They still must win at the Redskins on Sunday, but they also need Minnesota to lose at home to the Bears if they are to claim a wild-card spot.